To say it's been a roller coaster of a seasonal ride would be an understatement. With cold temperatures right through mid-June, flooding rains in July and the season of implement breakdowns, it looked like the flowering season may never actually get going at all. Thankfully with the kind support of a fellow market vendor (Doug Stanton from the Chocolate Cow) and his very handy single furrow plow, the work started earlier in the spring was finished and the flower field was planted. Finally finishing into the first week of July was frustrating, disheartening and a relief all at the same time. This season saw my first ever actual and complete breakdown over the weather - ever. Sheesh ~ Hard but joyful work indeed. But mother nature (I'm sure having sensed my total emotionally challenged state) came through and the warm and lovely summer that followed brought on one of the loveliest flowering seasons ever. Wedding bookings were saved from having to hit the Plan "B" button and market flowers, while later than ever, finally made their way to The Urban Farmchick market table early September. Now, with the forecast decent and a little help from frost protection hoop tunnels, here's hoping that we see the end of September and beyond for this flowering season. 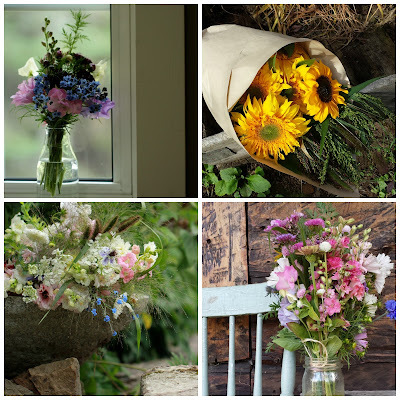 And now, for the first time, with the gardens literally bursting with the flowers, grasses, vines and herbs so carefully seeded, tended and ready for harvest, you can order Fresh Cut Urban Farmchick flower bouquets online (and for delivery - with exceptions). To all you Urban Farmchick peeps who continue to support my love of flowering and getting dirty, THANK YOU, I really really really appreciate you all!! Our regular, oh so pretty, Urban Faramchick style market bouquets will continue to be available at market every Saturday, 8 a.m. - 1 p.m. but you can also order those online - for pick up only. Here's to growing flowers, the good, the bad and everything in-between.